Traveling with kids this summer! We have all heard the dreaded “are we there yet” and with a few simple toys, we can avoid most of this. Think games, small toys, easy to carry (and stow) activities or playsets. Each pick here also was selected because it works in the car, the restaurant along the way, and in the hotel room when you arrive! However, if shopping on your own, you should consider three things: (1) portability – is it easy to take with you? (Lightweight, small, packable, pieces stow inside, etc.? ), (2) versatility – can it be used in the car, and the restaurant AND the hotel?, and (3) flexibility – can multiple children use it? in multiple ways? Board games are perfect for travel – you just have to look for portable ones. There are lots on the market for all ages and interests. Most sell for under $10 each. One to note is the Grab and Go Monopoly (Hasbro). The Grab & Go game is a compact mobile version of the Monopoly game with all the classic properties, Community Chest cards and Chance cards, with part storage in the game board. Some games are naturally portable. They don’t have larger counterparts, they are just built to go. So make sure to look for them in the store. One to note is the Back Spin game (ThinkFun). It is a double-sided brainteaser. It might look simple at first, but this cleverly addictive puzzle that will keep kids entertained in the back seat for hours. This game retails for $15 and is ideal for kids eight and up. While coloring books are a travel classic, get more milages out of artistic creativity by picking up a Fashion Plates Superstar Deluxe Kit (Kahootz). It has imagination and art in one, as a child can create fashion and outfits and color them in. One sibling can create and the other can color. Plus, it is compatible with other Fashion Plates sets, making in function at home and on the go. Great for ages 6+ and retails for about $25. For younger and older kids around 3-8 years old, look into the Janod 4-in-1 Magic Magnetic/Blackboard Suitcase (Alex Brands). It has 4 different boards to explore all the creative possibilities: a Blackboard with chalk and eraser, a whiteboard, a magic table with stylus, and magnetic board with 42 magnets. You can even buy extra magnets for more play potential, and the price is a reasonable $11! 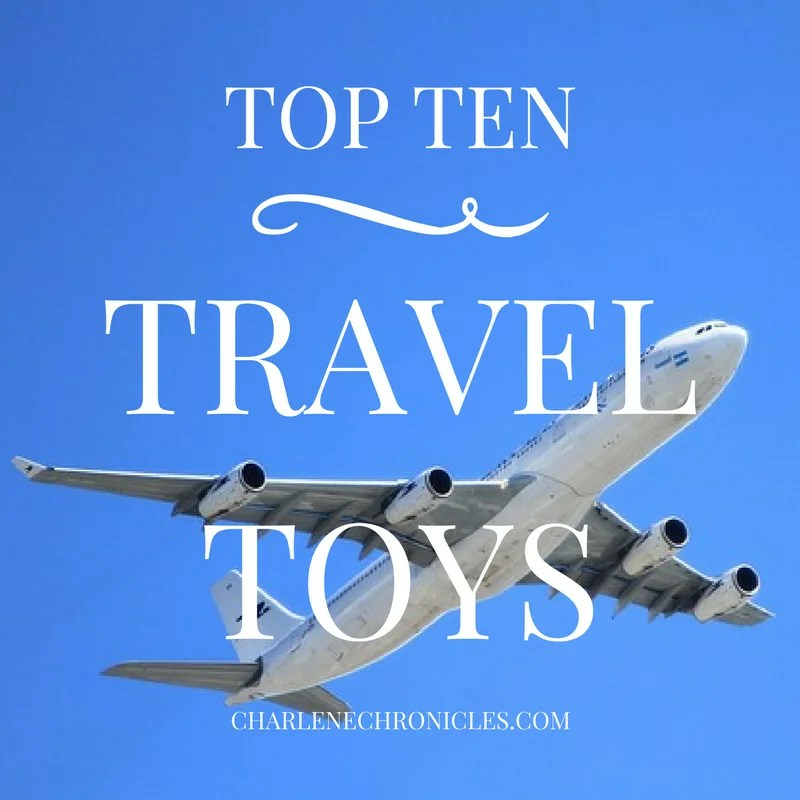 Figure toys are the perfect way to incorporate role play and education into travel. A personal favorite is the Schleich brand. For over 80 years, these toys have been hand-painted with exquisite detailing and realistic features. Kids can create stories and adventures, play hide and go seek with them in the hotel room, or learn about each figure, like these gorgeous dinos. Great for kids 3+ and the retail from $5 to $25. Finger puppets are a great add to travel. They can be tossed into a backpack or bag. Parents can play peek-a-poo from the front seat, and older kids can direct an elaborate backseat show. Lots of portable potential with finger puppets! Two brands we love are HABA and Folkmanis. Each puppet usually can be found for about $5 each. Some of the Folkmanis puppets even light up, have wings that flap or voices that quack! Also look for a travel pillow that turns into a travel companion. Pillow Pets Sweet Scented Pets (Pillow Pets) deliver the comfort of a stuffed animal by day and a familiar friend and pillow by night. Perfect for children who are afraid of traveling. Plus, they are lightly scented to take the stink out of travel too! Some have the delicious smell of chocolate chip cookies or cotton cant! For kids 3+ and retail for $30. Here are some other things to have in your bag at all times – not just for the long trips! Crazy Aaron’s Thinking Putty is perfect to have in reach at all times. It stretches, tears, shapes, rolls, and squishes for imagination creation that doesn’t stick to clothes or the car seat, doesn’t dry out, and stores in its own tin for easy travel. It is perfect for restaurants and is a great replacement for iPad pre-dinner. You can find versions for around $6 a tin for kids 3+. Another favorite is the Colorforms Take Along Set. Each set has 2 colorful backgrounds and 36 Colorforms pieces that stick like magic, but can be reused over and over for storytelling and play! Great in the car or on the plane as it is a small foldable set. It was even names on of the top 100 Toys of all time by Time Magazine. Ideal for kids 3+ and sell for $6. They are even great to keep kids entertained at birthday parties! Lastly, don’t forget something like Read-Along Story Books and CDs. While you can buy them in the store, your local library will have plenty to choose from for all ages. Great for those that get car sick from reading. Older kids can read along and younger kids can listen. A great alternative to movie players in the back seat. Bonus is that the book can be a bedtime story in the hotel! Want to learn of other toys and creative ideas for your next road trip? See my travel toys feature on NECN recently! And leave your favorites in the comments below!